As mentioned in the Test Realm patch notes we posted on last month, a blue Blizzard post confirms that they are indeed removing restrictions to allow players to create Death Knights on any server. Previously you could only create a Death Knight on a server which housed a level 55 or higher character on your account. The next update takes away that restriction, allowing Death Knights to pop up all over the place...well, almost. 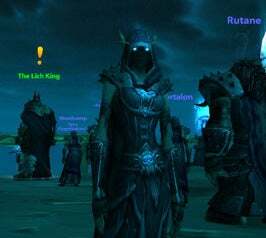 With the next minor content update for World of Warcraft, we will be opening up death knight character creation so that if the account you play already has a level 55 or higher character in World of Warcraft, you will be able to create a new death knight on any realm within your region. Please keep in mind that restrictions still apply to new, non-transfer realms such that death knights cannot be created on those realms until you level a character to level 55 on that realm or until transfer restrictions are removed. Those of you who paid $25 to transfer a 55+ character to a friend's server in order to play Death Knights with them before this announcement remain completely screwed.